The Royal College of St Peter usually referred to as Westminster College has been here (in the grounds of Westminster Abbey) since the 12th century. With a role of 750 this is one of the most prestigious and expensive schools in the UK, costing nearly £10,000 a term for a boarder. Apparently this pays off as the school has the highest Oxbridge entry rate, at 49.9% between 2002 - 2007. Very fine building! Steeped in history. Suprised to find Mika as a former pupil!! I always wondered what it was. Wait long enough and I know you will tell us someday! Yes but if you want to be PM you must go to Eton old boy, Westminster only produces cleggs! Gulp, that fee is mind-boggling to me. The building is magnificent though, as I'm sure its history is too. My cousin used to teach music and maths at Westimister College! Then he felt the pull of Africa and left to teach at a school in Botswana (www.maruapula.org. He is now retired but keeps up with his old schools. The boys had to endure hours of "chapel" and used to play "pulpit cricket" scoring whenever the priests made cricketing signals with their arms or if they said anything that could be interpreted as being related to cricket. Wow, that is quite expensive. actually that isn't the school. through the arch is Dean Yard and the school is (mostly) in Little Deans Yard which is off that. They also have various other building scattered around the area. I studied in London during college and would often stare at this building, never knowing what it was! Beautiful photo! 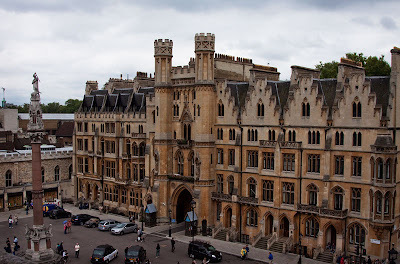 I went to Westminster, and I can tell you that that building's not part of the school - it has buildings dotted around Dean's Yard, but mostly in Little Dean's Yard (and all far nicer than that).